When Lois and I discovered that we were going to be in England for the beginning of the High Holydays we were somewhat concerned about finding a Synagogue for Rosh Hashanah. We were going to be in the town of Newton Abbot, in the county of Devon, which is about four hours west of London and hoped we would be able to find something closer than London. When you need to find something fast, you hit the Internet, which is exactly what Lois did. Much to our delight and surprise she found a Web page for a Synagogue in Exeter, a city just 20 miles from Newton Abbot. Using the e-mail address from their Web page Lois sent them a message asking about their services and whether it would be possible for us to attend and participate. Thus began our "Excellent Exeter Adventure". What we hoped for was a timely response via e-mail. What we got was an almost immediate telephone call to Lois from the President of the Synagogue, Sonia Fodor. She wanted us to know that we would be welcome at their services and that she looked forward to meeting us. Via snail mail she sent us their schedule of services and directions to the Synagogue. Even though we had a map and directions, we allowed more than an hour to travel the 20 miles from Newton Abbot to Exeter. We needed every bit! ! Exeter is a small city, but the streets are not well marked and most are one way only -- a fact not mentioned on the map that we had. It didn't take us very long to get lost, big time! Luckily, we saw a group of traffic wardens and stopped to ask directions. After observing the blank looks on our faces as he described the maze we would have to take, the leader said, "Why don't I just get in the back of the car and take you there?" We knew this couldn't be New York or even Kansas. We arrived at Mary Arches Street and the Car Park. and began the process of looking for the synagogue. 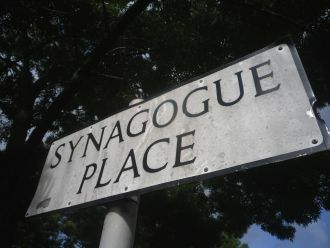 Luckily we saw a sign that said, "Synagogue Place" because without it, we would still be hunting. The street was no wider than two people walking closely side by side and completely unremarkable -- more of an alley than a street. A man dressed in a suit came towards us as we walked down the alley and showed us to the door of the synagogue which was also unremarkable. He unlocked the door and in we went. What a difference! Inside, it was like a tiny jewel box. The Ark was beautifully simple and the Bemer was so small that when people got called to the Torah everyone had to move around very carefully or someone would fall off. The sanctuary itself was very small and probably about 30 feet wide and 75 feet long. The remaining three sides of the sanctuary contained three rows of 10 bench type seats with folding reading platforms for the prayer books. The sanctuary also had a balcony which was not currently in use. However, the men sat on one side of the sanctuary and the women sat on the other. 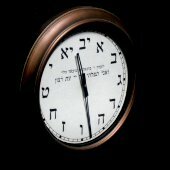 The services were very traditional and conducted entirely in Hebrew except for some English explanations, from the Rabbi, of various prayers, groups of prayers and ceremonial portions. The service melodies were not unlike ours at Beth Emeth and we felt very much at home with the entire service. Joel was even given the honor of being called to the Torah during the first day. The congregants were warm and friendly and made us feel very much at home. After services we had an opportunity to talk with some of them and learned more about them and their Synagogue. A number of Jews from Italy settled in Exeter during the 1750's and by 1757 the Jewish community was sufficiently organized to lease a burial ground which is still in use today. In 1763 the Exeter Synagogue was founded when Abraham Ezekiel and Kitty Jacobs obtained a lease for 'a parcel of ground in the parish of St. Mary Arches' on which the present Synagogue was built. Enlarged, restored and rebuilt as centuries past, it is currently being refurbished largely through the spirited efforts of Sonia Fodor. Frank Gent and others. Funding for a complete restoration was obtained from the government and the community including the churches and work was just being completed when we saw it. Regular services were revived in 1980 and now take place twice a month and on holidays and festivals. The present congregation is small and draws its members from Devon, Cornwall and Somerset. Their active membership is about 40 people, but their overall membership is larger. In addition to membership dues, the Synagogue raises money by giving tours of the building to school children and community groups. These funds are used to maintain the services and refurbish the Sanctuary. The congregants wanted to know all about our Synagogue and our services and were pleased to learn that their services and melodies were very much like ours. Had the Adventure ended with the end of services it would have been a marvelous experience, but such was not the case. The Synagogue President told us that she had invited some of the members back to her home for lunch following the services and she was hoping we would be able to join them. We accepted her kind invitation and found ourselves being guided to the top of a hill, overlooking the city, to a group of Regency attached houses, three or four stories high. Their apartment was on the second floor and there were lots and lots of books. It seems Sonia's husband is a librarian just like Lois. We were treated to a delicious lunch of home made gefilte fish, cheese, salad and of course, tea. Once again we were sure that our Adventure was about to end, but it did not. One of the lunch guests, a literary critic for the London Times, invited everyone to her home for afternoon tea. All the guests piled into cars and off to Salcombe Regis we went. Salcombe Regis is a tiny village right out of Silas Marner or any other of your favorite olde English novels. We were positive we both saw Miss Marple crossing the village green! The house, itself, was right out of a Merchant-Ivory movie -- a restored Georgian mansion, originally built by the brother of Samuel Taylor Coleridge. The cream colored walls and cobblestone walks led straight to a most fantastic garden. If you have ever read the "Secret Garden", you will be able to close your eyes and see this one. The land is criss-crossed by natural springs and our host and her husband have dammed up one of them to create a small waterfall and pond. Nearby is a spreading tree and a wrought iron bench. Huge bushes of flowering fuschia were everywhere -- not pots like we have, but bushes 4-5 feet tall in every color of the rainbow from lilac to rose to yellow to orange. The climate is very much like that of Washington State, misty and cool, so plants thrive. There were many flowers and trees spread over three different terrace levels. Inside the house was a living room with walls so high that they had erected a walnut balcony along one side of the room reached by way of a winding staircase. We had a delightful afternoon and as we made our way back to Exeter to drop off our new-found friends we decided that this had been one of the best Rosh Hashonahs we had ever spent. We highly recommend that should you be anywhere in the Exeter area, be sure to put the Exeter Synagogue on your list of "must sees".